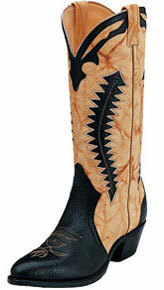 Determining How Western or "Cowboy" Boots Should Fit Is A Little Different From Other Types Of Footwear. Your Boot Size Is Not Necessarily The Same As Your Shoe Size. The Best Way To Determine Whether Boots Fit Is To TRY THEM ON. Wear The Socks You Intend To Wear With Your Boots For A Consistent Fit. Socks Of Different Thicknesses Can Affect How Your Boots Fit. Sit Down. It's Much Easier Get Your Boots On When You're Sitting. Put On A Plastic Bag Over Your Foot Before Attempting To Pull On Your Boot. It's A Great Trick To Help Get Your Boots On More Easily As New Boots That Fit Correctly Should Be A Little Snug. With Both Boots On, Stand Up And Walk In Them. Your Boots Should Feel Snug Without Pinching Anywhere. You Should Have Room For Your Toes. The Widest Part Of The Sole Should Be Where The Ball Of Your Foot Rests. You Should Feel About A Half An Inch Of Heel Slip - That's Normal. It Takes Two Or Three Days Of Wear Until The Sole Starts To Flex With Your Foot And The Slippage Stops.